Experience the frivolity of the fin de siècle, without having to worry about parking! One thing is certain: a trip to Paris is never complete without seeing the Moulin Rouge’s iconic red windmill, and better yet a show. The renowned theatre is located in Montmartre in Paris’ entertainment district of Pigalle. It has been frequented by the likes of Edith Piaf to Frank Sinatra, and as been the subject of many films, the latest being the spectacular Baz Luhrmann’s 2001 film “Moulin Rouge”. 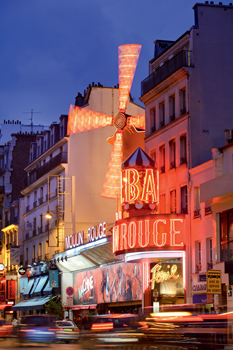 So if you fancy a night out like no other, we recommend the most iconic cabaret in Paris, the Moulin Rouge! Oozing with nonchalance, light-heartedness and a sprinkling of joie de vivre. It was born in a time of great social fusion, when the Industrial Revolution promised a better life for all, known as the Belle Epoque, people flocked to the Moulin Rouge for a night of decadence and indulgence. It’s the birth place of the cancan and all things fabulously fun and French! Known as the Temple of Music and Dance, the Moulin Rouge has earned itself an international reputation. Its shows or Féeries feature 80 artists, comprise of 60 Doriss Girls, outstanding international acts with costumes designed and made in Paris all set in surroundings designed by Italian artists. All of this is performed to original music recorded by 80 musicians and 60 chorus singers. As if all that wasn't enough, you can wine and dine whilst taking in the spectacle! Please bare in mind that the dress code is business casual, so leave your flip flops at home! Also the Moulin Rouge is a non smoking establishment, but it is one which drinks - 800 bottles of Champagne are drunk every night to give you more of an idea! We would also recommend that you arrive 30 minutes before the start of the show or your dinner reservation, as to miss a single second would be a travesty. Do you have some time before the show starts? Well then take a look at the Sacré-Cœur de Montmartre or the Place Pigalle. And if you're an art enthusiast then don't miss the chance to go to the Place du Tertre, which is the former stomping ground of the greats - Dali, Picasso and Van Gogh. If you’d prefer to park on the outskirts of Paris, then you can easily get to the centre by public transport, simply take the metro line 2 to Blanche Station. From here you can walk to the Moulin Rouge! This truly is a sight to behold, a veritable feast for your senses. Enjoy the show!